Adjustments: low profile flush ceiling mount, easy installation, and cable management. 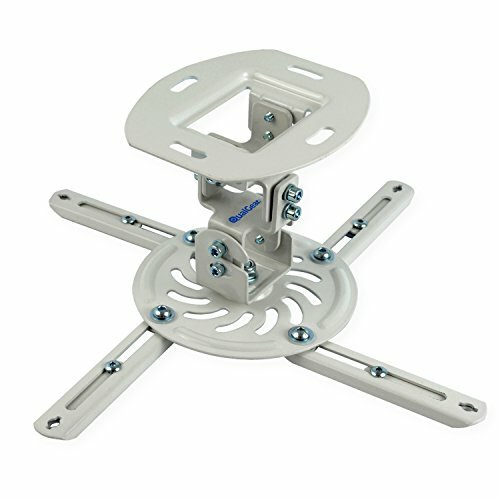 This projector mount works with both regular and sloped (vaulted) ceilings. Features horizontal and vertical angle adjustments for perfect Projection. Projector compatibility: universal design that fits most Projectors in the market. If your projector weighs more than 29.7 lbs., this mount will not work for your projector. Adjustable extension arms are included and they extend up to 400mm to fit wide array of Projectors. Specifications: maximum weight supported: 29.7 lbs. / 13.5 kgs. Color: White. Ceilings supported: regular wooden ceilings or concrete ceilings. This projector mount supports both regular and sloped ceilings. Pitch angle adjustment: -15 to +15 degrees. Roll angle adjustment: -15 to +15 degrees. Swivel: 360 degrees. Vertical tilt: 0 to 90 degrees. If you have any questions about this product by QualGear, contact us by completing and submitting the form below. If you are looking for a specif part number, please include it with your message.